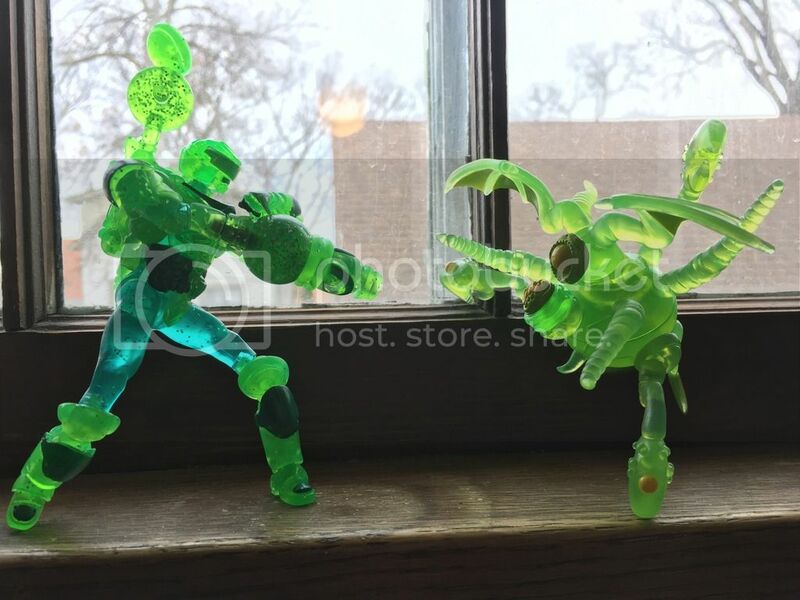 I'm usually all in for anything Glyos, but that vector Jump armor is not for me. Too much action figure and basically no build ability unless you want something goofy looking. His tiny hands bug the hell out of me too. Netkid wrote: So if I'm reading this right, the knight's torso armor piece is NOT removable, it's glued on, and some of you snapped it in half trying to remove it??? 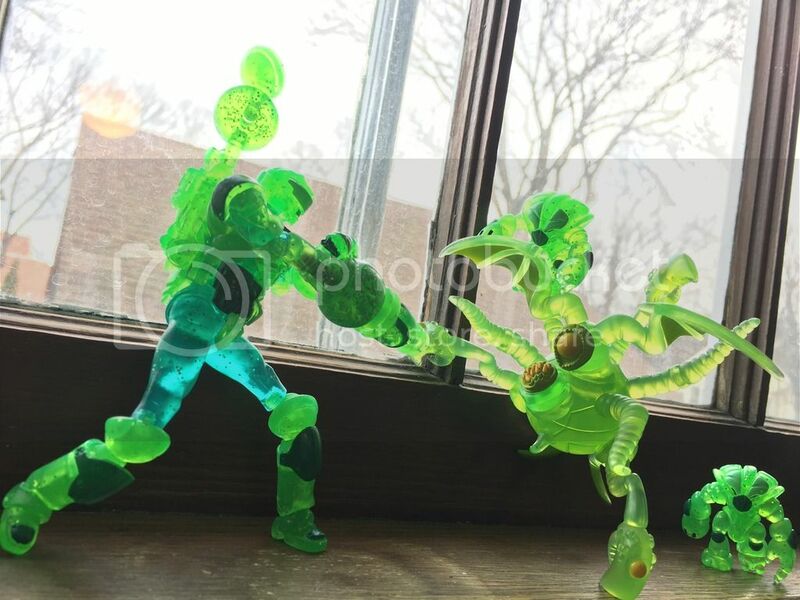 Is it not made from the super durable glyos PVC??? Please explain. I imagine it's the same plastic, it's an issue with the shape and construction. The Glyarmor is mostly "U" shaped and totally open on the sides. Slides on and off like a sandwich board. It is also one single mold. The knight's armor is very form fitted to a tapering human-type torso. It has sides that wrap around under the arms, that while not connected at the side, nevertheless hug the body too tight to slide up over the wider shoulder area, even with the arms off. The plastic of the armor is thicker, giving less flexibility. Worst of all, the piece appears to be molded in separate front and back sections, fused or glued only by two relatively small points over the shoulders. If you must remove it, I would suggest holding under a hair dryer until it gets as malleable as possible, but you are probably better off leaving it on. MaxEPadd wrote: I'm usually all in for anything Glyos, but that vector Jump armor is not for me. Too much action figure and basically no build ability unless you want something goofy looking. His tiny hands bug the hell out of me too. My thoughts exactly. I'm glad others seem to dig it but I have no qualms about passing it up. My order has been travelling the US for days (not really getting any closer to me) and now no longer even has an expected delivery date. Someday I will get to enjoy these, someday. Can someone please post a pic of the mystery figure? I'd love to see it! Vector jumps look great as they are, but I will agree with everyone's criticism. The shoulder pads come off way too easily, even the backpack doesn't feel very secure. They are really cool for display but build ability and being able to pocket them and fiddle with them isn't there yet. They kind of feel like prototypes. Still they look so awesome standing in the ranks but I would have much preferred the shoulder pieces being plugged in with a peg or even just a solidly molded new arm. The backpack needs to be pegged in and the chest armor should've been designed as one piece that slips over like the glyarmor. I had no interest in KOTS beforehand so it's cool to get a figure that resonates better but I wish it was kept in the oven a bit longer. 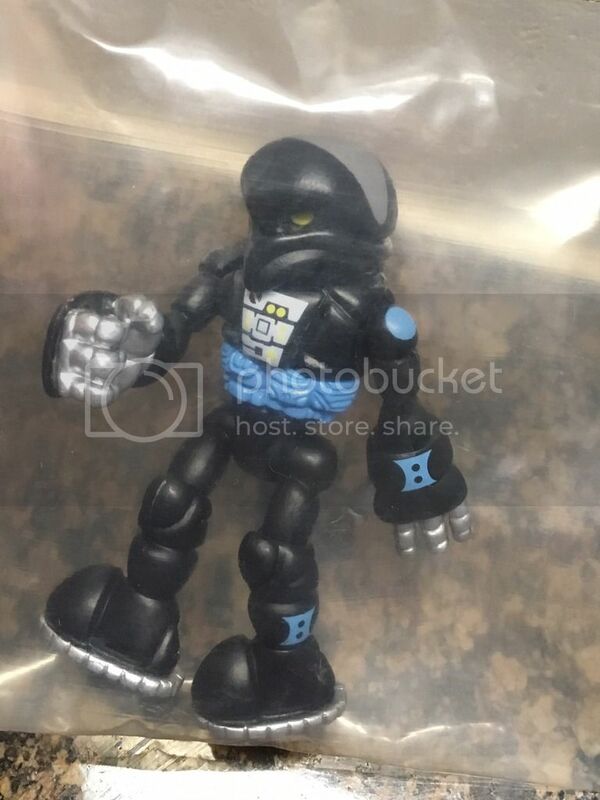 Jimbot wrote: Can someone please post a pic of the mystery figure? I'd love to see it! It's still in the bag, but I think you can see it pretty well. I'll just leave the link in case anyone doesn't want it to be spoiled. WOW! That's amazing!!!!! Now I really regret missing this drop . Anyway, thanks a lot for sharing... I appreciate it! 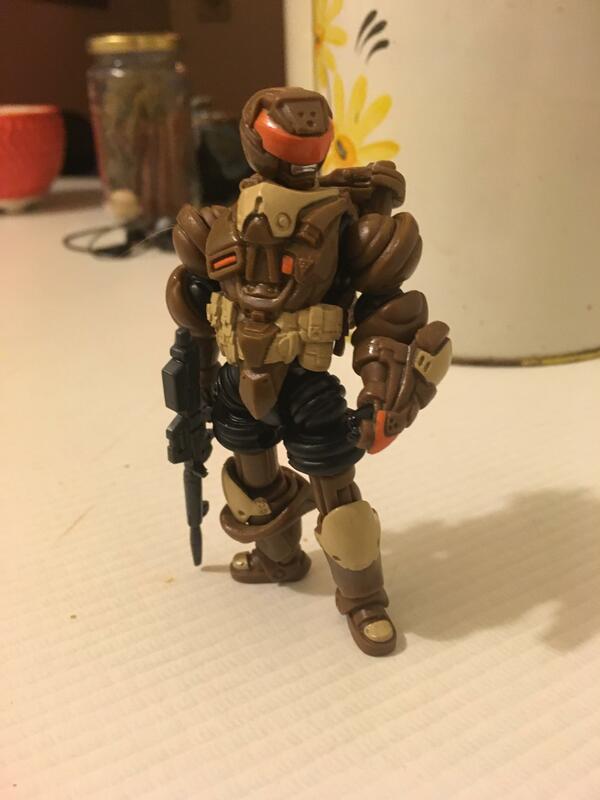 Hey - Can someone post a picture and/or the nameof the figure that the mystery figure from this drop (Pheytron) is an homage of? 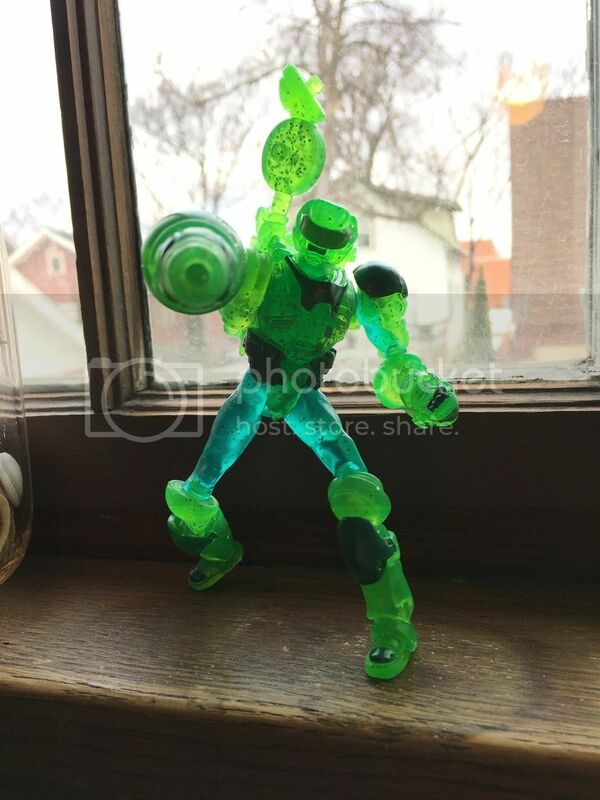 I have seen the figure and may actually have it somewhere, I just can't remember what it's called or what series it's from. It's driving me crazy. Thanks! Fisher Price Clawtron. Released on a single card along with the translucent green X-Ray man and woman. M22XSuperSteel wrote: Fisher Price Clawtron. Released on a single card along with the translucent green X-Ray man and woman. Not so strange: they were inspired by Micronauts. podunk wrote: Vector jumps look great as they are, but I will agree with everyone's criticism. The shoulder pads come off way too easily, even the backpack doesn't feel very secure. They are really cool for display but build ability and being able to pocket them and fiddle with them isn't there yet. They kind of feel like prototypes. Worst part for me is the neck and that little scarf that won't say in place. Overall the neck is too long (even on the regular figures) and when you pry the vector jump armor off; there's this ugly gap that the scarf can fill but then the armor won't fit over it. Its just really poorly done. I was going to permanently shorten the neck but I don't like the figure enough to want to modify it. Anyone who doesn't find happiness in their KOTS Vector Jump figures can contact me for sale/trade opportunities. 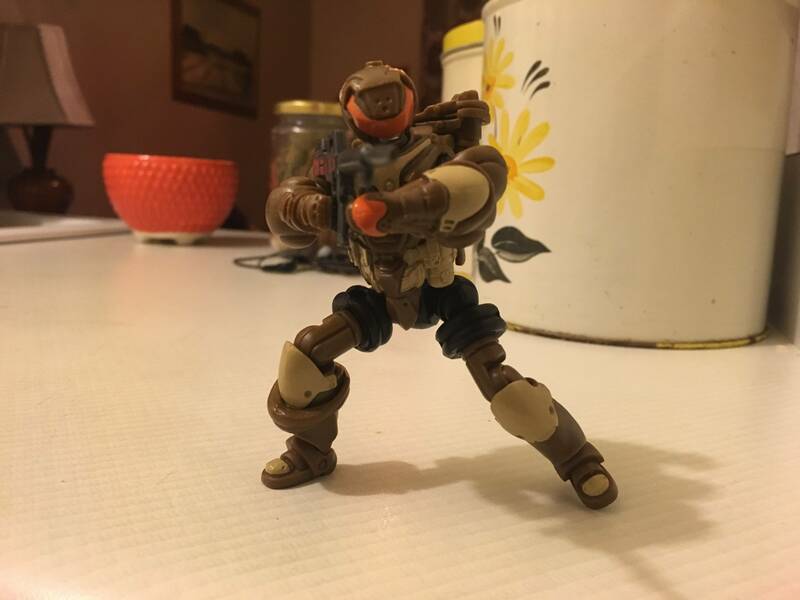 Hmm, I think the Vector Jump figure is pretty great. The design feels like something that could have come from Aramaki's desk in the 80s. There's probably a little Spiral Zone in there too. If I were to voice any sort of complaint, it might be that I wish it were scaled to 3 3/4" or Microman figures so it could fit in with those lines. I haven't had trouble with the shoulder or backpack pieces like others here. I can swoosh the Galaxy Phase one around pretty well without knocking them loose. I'm wondering if it may have something to do with the temperature in your area, i.e., colder temperatures could reduce the friction fit of the pieces. That's odd because I'm not having any trouble with my Jump guy. All his pieces stay in place pretty well. Knights of the Slice/Vector Jump figures lend themselves to great build upgrades via axis joints and phase arm sets. Big hands taken from a Pheyden. For a little added fun, you can squeeze a Robo Force fist into the backpack opening to create new types of back packs. Did a little augmenting on the Knights of the Slice Vector Jump. I love this galaxy phase green! 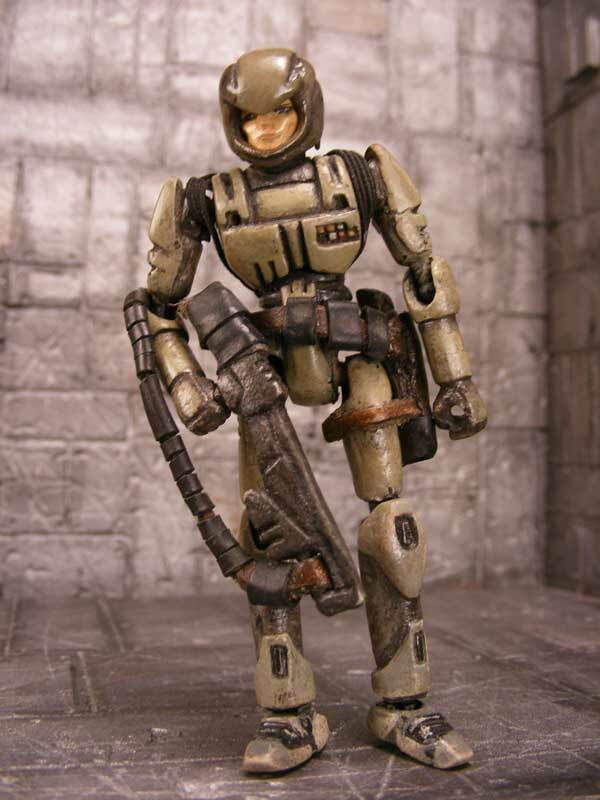 Those are pretty cool builds, but its such a jarring shift from the KoTS style to more traditional Glyos style. Just looks a little wonky to my eyes. Definitely the best builds I've seen with 'em though. This is my first Knights of the Slice figure, and I think it's great. I personally don't see the issues that many here have expressed. Pretty neat to see these ideas evolve and become reality over the years. Dang. Now I kinda wish I hadn't sold mine off. Those builds look great.